Ribbon Cutting: Richard M. Renkin & Assoc. Law Office of Renkin & Associates provides professional, experienced representation to individuals in all areas of family law. They are committed to finding the most workable solutions through negotiation and mediation; however, when necessary, they are prepared to aggressively represent clients in trial. Richard Renkin’s expertise in family law is demonstrated by the following: earned the Martindale-Hubbell AV Preeminent Judicial Award; selected into the Top Ten Family Law Attorneys by the San Diego Daily Transcript; rated 10.0 on Avvo; selected to Super Lawyers seven times; Certified Family Law Specialist; and Past President of the San Diego Family Law Bar Association. The AV Preeminent Judicial Award is considered the highest possible distinction that can be given to an attorney. Richard’s earning it showcases his commitment to the ethical practice of law and his devotion to his clients. Richard M. Renkin is a Certified Family Law Specialist. In order to become a Certified Family Law Specialist, a lawyer must: (i) demonstrate significant, recent experience in the field of family law, (ii) satisfy intensive educational requirements (beyond law school), (iii) pass a written exam, (iv) receive favorable recommendations from his or her peers in the legal community, and (v) successfully represent himself or herself in front of a panel of family law experts. Richard M. Renkin has been assisting clients in the San Diego area with family law matters since 1991. 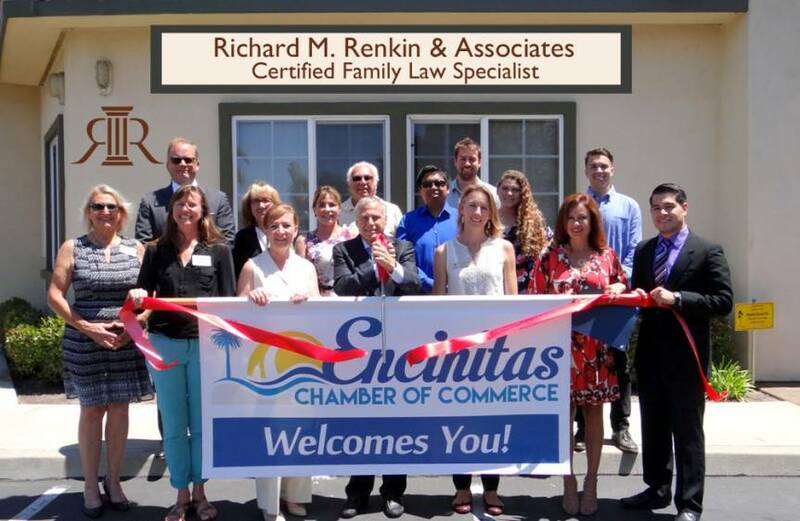 The Law Office of Renkin & Associates recently moved to 320 Encinitas Boulevard for its business location. Richard likes to be involved with the local community and joined the Encinitas Chamber of Commerce to connect with his fellow business owners.